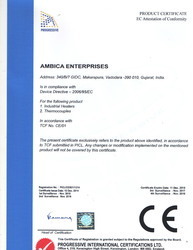 Since its inception in 1992, the Manufacturing, wholesaling, retailing and Supplying company Ambica Enterprises, has developed into a trustful entity and pioneered the industry by providing high performing Industrial Heater and Thermocouple. Owing to our diversified technical and professional expertise, we have developed a wide range of revolutionary products including Mica Band Heater, Ceramic Band Heater, and Cartridge Heater that earned us the most reputable ISO 9001:2008 certification. Being the industry leaders our role becomes tougher to meet the complex needs of our prestigious clients. We strive to deliver products with peak performance that are innovative, custom designed, easy to install and operate, require low maintenance, and serve a durable service life. Owing to our advanced engineering prowess and application knowledge, we are capable to serve the productive performance in a large number of industries including pharmaceuticals, chemical, plastic, engineering, rubber, fertilizers and pesticides. We posses a highly advanced infrastructure and implement latest technology at every stage of our business operations, which earned us the portfolio of a marketing leading brand. 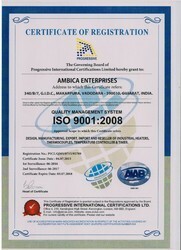 Customer satisfaction and business ethics are at the core of our company that drives us to operational excellence. Under the valuable guidance of Mr. Ravi Bhawsar, we are where our customers want us to be. He is an experienced persona who is well versed with business technicalities. His efforts have helped us to achieve value in strategic planning, talent development, innovation and most important customer satisfaction. Manufacturing and Trading of Industrial Heater and Thermocouples. Our higher level of productivity is all due to the modern infrastructure we own. Our manufacturing base is equipped with latest machinery, which is performing at its best to provide low cost production. Our warehouse is spacious with optimum storage capacity; in addition to this we have high speed internet connectivity to foster our supply chain. Our infrastructure is parted in various units of production, quality, packaging and delivery. 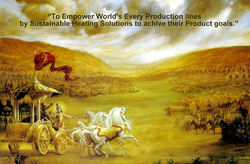 "To Empower World's Production Lines With Sustainable Heating Solutions to Achieve Thier Prouduct Goals"
We have a highly skilled team of professionals from diverse academic backgrounds who have rich experience of their specific domains. Our team comprises of diligent product development engineers, proficient operations managers, efficient quality control officers and dedicated team of sales and marketing personnel. Due to their efficiency we are able to perform every operation accurately and with improved productivity every time. what if you have already Know the solutions before Breakdown??? What if you already know what to do when Breakdown?? What if you don't Face Frequent Breakdown?? For That Cause HEATBIRD is flying with Solutions to stop possibilities of Production loss in advance to each and every Production lines of the world . The reason behind our steady expansion lies under our quality policy, which makes us to deliver higher standard with each finished product. Our quality policy is based on defined industrial standards and we make sure to follow these rigid parameters at every step from production to distribution. 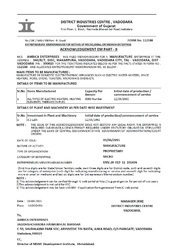 We procure raw materials from authorized vendor base to confirm the ingenuity of the delivered material. Besides, every finished product undergoes strict quality inspection to proof its caliber, which represents our brand reputation.